Just a seven-hour drive from Salt Lake City (or less, depending on how closely you observe speed limits) is Durango, an old west town with modern-day charm. Established in 1881, Durango, Colorado is well known for its summer activities—mountain biking, river rafting, rock climbing and so much more. But fewer visit Durango in its slower season, winter. Don’t let this fool you, Durango is bustling with an array of exciting winter activities—dog sledding, skiing, snowboarding, ice climbing, cross-country skiing and snowshoeingjust to name a few. The town also hosts a wild winter festival, Snowdown, which features an annually changing theme, a parade, live music and a plethora of winter activities for adults and kids alike. 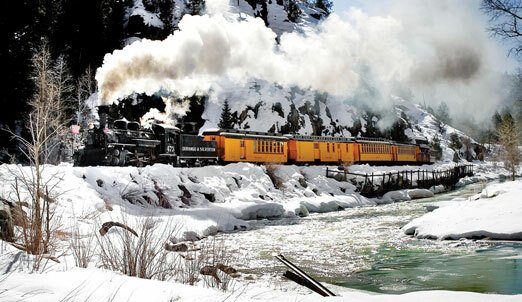 The famous Durango & Silverton Narrow Gauge Railroad runs year round and offers trips to scenic Cascade Canyon on the historic, steam-powered train. The 52-mile roundtrip journey takes you through a winter wonderland of snowy mountains, frozen rivers and beautiful scenery, which you can enjoy from the comfort of a heated coach and the open-air car. You’ll stop in Cascade Canyon where you can enjoy a fireside lunch and a walk along the Animas River before heading back to Durango. Durango may be a historic western town, but don’t expect all the dining to be cowboy grub. The city is teeming with incredible restaurants, including sushi, ethnic cuisine and Durango’s famous breweries. There are four spectacular brewpubs in town, but the lively atmosphere and standout food at Steamworks Brewing Company make it a favorite. Located just down the street from the Rochester Hotel and Leland House, Steamworks features tasty fare like giant pizzas, hearty salads and the popular Cajun Boila pot full of boiled shrimp, crab, sausage, potatoes and corn on the cob dumped on the table and eaten any way you can. And be sure to order an award-winning beer like the Colorado Kölsch or Steam Engine Lager. Insider tip: Visit Steamworks on a Friday night to enter a raffle to win a free keg! If you prefer fine dining to pub fare, look no further than Mahogany Grille, which is located inside the Strater Hotel on Main Street and specializes in New American cuisine with international influences. Live piano music, great service and an elegant setting make this casual fine dining destination one not to be missed. After dinner, indulge in the Bananas Foster, which is made from bananas flambéed tableside over vanilla ice cream with a tasty butter, brown sugar and brandy sauce. It’s said that Utah has the Greatest Snow on Earth, but don’t let that stop you from skiing Durango Mountain Resort (Purgatory) while visiting. The resort boasts a new lodge, high-speed quads and gorgeous forest terrain you can truly lose yourself in. Purgatory isn’t as steep as many Utah resorts, which makes it a relaxed learning environment for beginners and casual skiers. But if you’re looking for a challenge, explore the resort’s backside where you’ll find black diamonds, tight tree runs and moguls. For all you park junkies, spend time lapping Purgatory’s four terrain parks, which boast rollers, rails and the occasional 20-footer. For a unique Durango winter activity, take a full- or half-day dog sledding tour with Durango Dog Ranch. You’ll see Colorado’s Rockies from a new perspective and get to ride and drive the sled, interact with the dogs and enjoy hot drinks and snacks along the way. For prices and tour information, visit: durangodogranch.com. After a day on the slopes, drive 15 minutes down the road to Trimble Hot Springs. The only hot springs in Durango, Trimble has two naturally heated mineral pools, two saunas and a full spa. Visiting here is the quickest way to relax after an exhausting ski day. If you’re hoping for a bigger hot spring experience (and don’t mind driving an hour out of town) Pagosa Hot Springs is a retreat worth experiencing for yourself. Twenty-three hot mineral water tubs are terraced to overlook the beautiful San Juan River and range in temperature from 83 to 114 degrees. There’s something for the whole family to enjoy at the hot springs from the adults-only area to the family-friendly swimming pool and a fresh-water Jacuzzi. For the ultimate Pagosa experience, stay at The Springs Resort, which offers luxury suite accommodations at their new LEED certified hotel. This green-built hotel is made of 75% recycled materials, uses 30% less energy and water than standard hotels and is 80% heated through geo-thermal sources. Plus, the rooms are spacious, modern and include plush robes for use during your stay and 24-hour access to the hot springs, a privilege granted only to hotel guests. As you drive home from an incredible weekend in Durango, consider stopping at Mesa Verde National Park, the entrance lies just 35 miles west of town. Few cliff dwellings are open in the off-season, but crowds are non-existent and free ranger-guided tours are offered daily. So the next time you’re looking to escape Utah’s inversion for the weekend, hop in your car and drive to Durango. You’ll be surprised by just how much you enjoy this Four Corners town and its friendly residents. But don’t stay too long; as many transplanted Durango residents say, if you visit for long enough, you’re never going to leave!